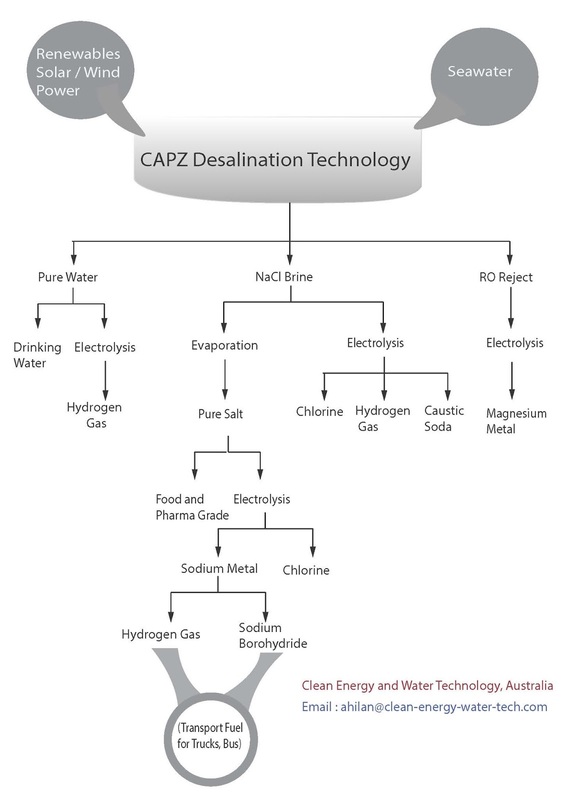 Clean Energy and Water Technologies: CAPZ desalination technology uses only Sun,Sea and WInd ! 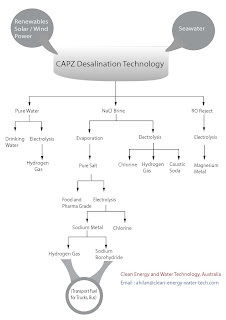 CAPZ desalination technology uses only Sun,Sea and WInd ! CAPZ (Clean water at affordable price with zero discharge) is a new desalination concept that separates seawater into fresh drinking water and industrial salt both simultaneously using only sun and wind power. Seawater is nothing but fresh water in abundance with valuable mineral salts dissolved in it. These minerals include Sodium, Potassium, Lithium and Magnesium and a host of other minerals in traces. It requires a holistic approach to separate them in their pure form along with fresh water for potable and industrial applications. CAPZ technology precisely attempts to do that so that the seawater intake can be put into huge economic usage while reducing or eliminating completely the discharge of highly saline effluent contaminated with chemicals back into the sea. With increasing demand for fresh water and depleting sources of fresh water due to natural and man-made causes , sea water has become an important source for fresh drinking water. Sea water is not only a source of fresh water but also a new source of clean Hydrogen an energy of the future. It requires only sun ,sea and wind to achieve this!